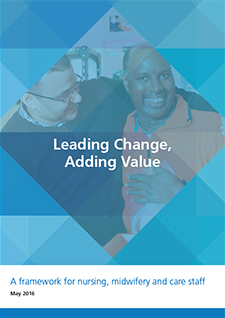 Leading Change, Adding Value is a framework for all nursing, midwifery and care staff. An easy read document is also available. We have opportunities and responsibilities to make a difference in narrowing these gaps no matter where we work. What is important is that we understand where we need to align our efforts to undertake activities that are of high value. Throughout this framework we use the terminology ‘we’ and ‘our’ to represent all nursing, midwifery and care staff wherever we work and whatever role we do.